click,click,click,click,click, forfeit an agenda: Add Liberated Chela to your score area as an agenda worth 2 agenda points. The Corp may forfeit an agenda to prevent this. If he or she does, remove Liberated Chela from the game. 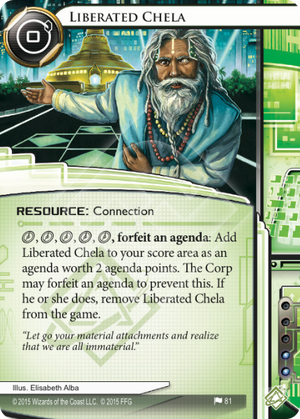 If the Runner has 5 agenda points and a Fan Site in their score area, can they use Liberated Chela to win the game before the Corp can forfeit an agenda? No, if adding Liberated Chela to the score area is prevented, then it never becomes an agenda at all. Let go your material attachments and realize that we are a- OH MAN! This Fan Site you have is totally bitchin'. Unfortunately it still isn't possible to win without any steals unless the Corp is dumb, since Fan Site guarantees they have an Agenda to forfeit to stop him going off. In terms of the click requirement...you likely need Hyperdriver or Amped Up in a pinch. You want to be able to install and trigger him in the same turn. This makes the whole thing start to get pretty janky and unwieldy (it only slots naturally into a deck already running Fan Site AND extra click cards) but the payoff (two Agenda points or force the Corp to forfeit) is unique so that's KIND of to be expected. It might be worth shoehorning into decks that have a very specific problem with losing at around 5/5. Probably the best current use of this card is to turn that -1 News Team into a 2 point agenda. If you're playing this along with Temple of the Liberated Mind, All-nighter or Hyperdriver or Amped Up then you'll only be too happy to take News Team as an agenda. Another use is for Fan Site although this has significant downsides when compared to News Team. For a start, Fan Site has to be out before the corp scores an agenda. Second, the corp now has an agenda which they might be willing to forfeit in order to stop you cashing in Liberated Chela. Notoriety has fewer problems than Fan Site - the corp doesn't need to score first although you might not like the economy of turning 1 point into 2 for the cost of getting Liberated Chela set up - however if you're on six points it could win the game for you.